Memory Foam Adjustable Bed | Kyvno's Story | What's The Kyvno Kit? SHAPE YOUR SLEEP. SHAPE YOUR LIFE. Kyvno’s story started as a dream … a desire to live an extraordinary life that is more passionate, vibrant and active. This idea was combined with a mission to empower sleepers to take control of their own sleep experience in a big way. So, we reached for the stars and devised a stellar sleeping solution that dreamers everywhere can afford! The Kyvno memory foam adjustable bed provides a fresh approach to catching ZZZs, so you wake up rejuvenated and ready to step up to the starting line of your best life each day. The Kyvno Memory Foam Adjustable Bed Kit is what dreams are made of, literally. It’s comprised of an adjustable base, a memory foam mattress, and a convenient remote control to provide life altering comfort while you sleep. Adjust your Kyvno to the position that meets your posture needs with the touch of a button. Turn up your awesome with the perfect sleeping position. Improve blood circulation and raise your oxygen levels helping you fall asleep faster and stay asleep longer. True story … science says so. 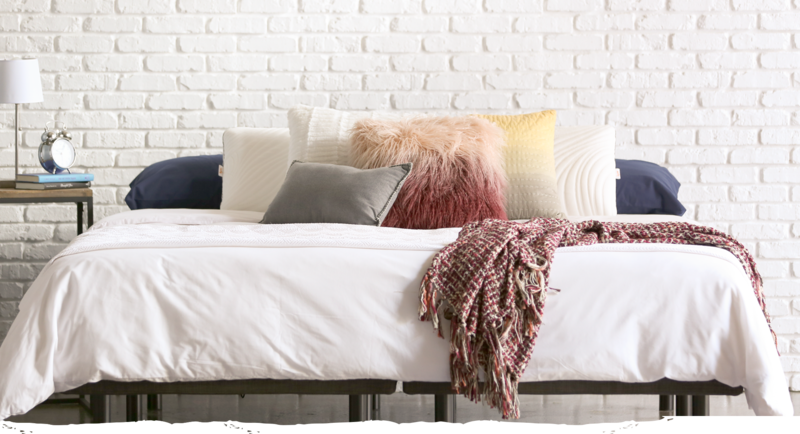 There’s a reason why wellness gurus love memory foam adjustable beds … they’re proven to drastically enhance sleep, allowing you to live your best life. Kyvno took this fancy-schmancy concept and made it affordable so you can soak up the revitalizing benefits of a perfect night’s sleep. Created specifically for those who lead an active lifestyle, the adjustable frame allows sleepers to achieve spinal cord support, reducing aches, pains and other pesky kinks that can hold you back from your awesomeness. Oxygen flow is maximized with customized posture support, which minimizes asthma and other breathing problems. #BreatheEasy. Elevated support for knees, legs, and feet has loads of health benefits. If you don’t believe us, Google it. You’ll see! Kyvno helps increase health and wellness … while you sleep! From work-at-home days to streaming movies and TV shows, the adjustable bed is fast becoming America’s favorite functional hangout. Whether sleeping, working, emailing, texting or reading, Kyvno’s remote-controlled memory foam adjustable bed enhances rest and relaxation no matter what activity you’re up to! So go ahead … adjust your bed and take control of your sleep and your life. How Does Kali’s Story Start with the Kyvno Adjustable Base Mattress? Is Quality Sleep The Answer To Nasal Congestion At Night? What’s The Best Sleeping Position for Your Body? Memory Foam or Spring Mattress? What is the Best Bed for a Studio Apartment? Is A Split King Adjustable Bed Right for You and Your Partner? Adjusting to a New Mattress? Here’s What You Need to Know. Why Buy an Adjustable Base Bed? The Kyvno Sleeping Solution. Kyvno is the most affordable, all-inclusive sleep solution, creatively engineered to revolutionize your sleep and your life! Website created by Frozen Fire. Copyright Kyvno 2019. Free shipping. Taxes applied at checkout.